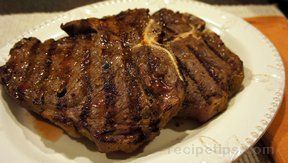 Succulent ribeyes with a little kick of temptation. Pierce steaks with a knife in several places. Place steaks in non-metal dish. Cover with marinade. Cover dish with plastic wrap and place in refrigerator at least one hour. (If marinating overnight, do not pierce meat.) 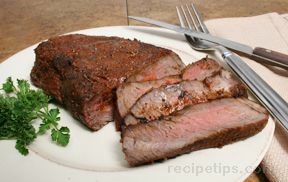 Remove from marinade and cook over prepared coals to desired doneness (make mine medium rare). Top with bleu cheese crumbles. 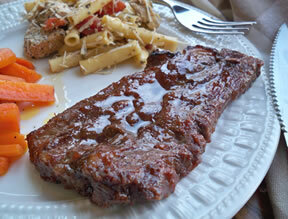 Bring leftover marinade to a boil in small saucepan, and then serve with steak.